After a long history of social injustice and inequity in fisheries access rights to coastal First Nations, a reconciliation protocol agreement was signed in 2009 between provincial and First Nation governments in an unprecedented move to support First Nations rights to co-manage coastal resources. This was big news and represented an important step in promoting shared decision making in resource management in coastal B.C. The reconciliation protocols were the start of many new dialogues between coastal First Nations and the B.C. Provincial government. In the ocean, this manifested in new ways to think about coastal planning and economic development. 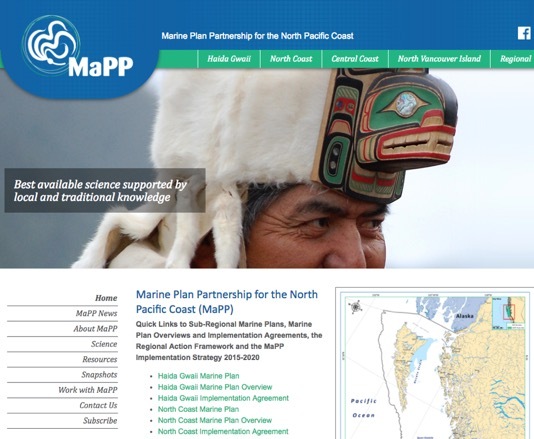 For example in 2011, a unique collaborative, ecosystem-based, marine planning partnership (MaPP) was initiated between 17 First Nations and the Government of B.C. with the goal to develop marine use plans to provide recommendations for the management of marine areas, uses and activities. Although the MaPP Initiative represents a remarkable opportunity to transform coastal management, none of the draft marine plans explicitly deal with the obvious challenges associated with sea otter recovery! This is an important gap, given the return of sea otters is a major disturbance that will affect many components of marine planning, including commercial and subsistence fisheries strategies, community livelihoods, marine protected area objectives and the design of shellfish aquaculture plans, and even transportation routes. Anne has set to work drafting a proposal to address this gap, seeking funds to bring people together and work on this important issue collaboratively.